Everyone has their old favorite ski from there years on the mountain and sometimes we are lucky enough to find a new indispensable pair. No matter what your choice is today, you will need some climbing skins to put on them on the way to the top. 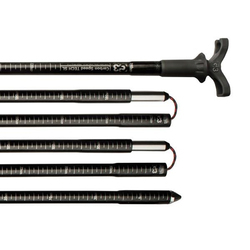 There are options for every length ranging from 80mm – 140 mm. Many options have adjustable ends to prevent slacking while traversing up. There are a variety of brands on offer including Atomic, Black Diamond, Genuine Guide Gear, K2, La Sportiva, Marker, and Volkl. Make sure you remember to get a bag for storing them on the way down to keep them ready to use on the next trip.